Portrait of Prince Metternich (1815[nb 1]) by Sir Thomas Lawrence. Klemens Wenzel Nepomuk Lothar, Prince von Metternich-Winneburg zu Beilstein (German: [ˈmɛtɐnɪç]; 15 May 1773 – 11 June 1859) was an Austrian diplomat and statesman who was one of the most important of his era, serving as the Austrian Empire's Foreign Minister from 1809 and Chancellor from 1821 until the liberal revolutions of 1848 forced his resignation. 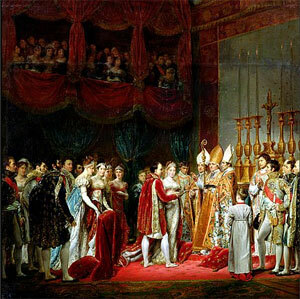 One of his first assignments was to engineer a détente with France that included the marriage of Napoleon to the Austrian archduchess Marie Louise. Soon after, he engineered Austria's entry into the War of the Sixth Coalition on the Allied side, signed the Treaty of Fontainebleau that sent Napoleon into exile, and led the Austrian delegation at the Congress of Vienna that divided post-Napoleonic Europe amongst the major powers. For his service to the Austrian Empire he was given the title of Prince in October 1813. Under his guidance, the "Metternich system" of international congresses continued for another decade as Austria aligned itself with Russia and, to a lesser extent, Prussia. This marked the high point of Austria's diplomatic importance, and thereafter Metternich slowly slipped into the periphery of international diplomacy. At home, Metternich held the post of Chancellor of State from 1821 until 1848, under both Francis I and his son Ferdinand I. After brief exile in London, Brighton, and Brussels that lasted until 1851, he returned to the Viennese court, this time to offer only advice to Ferdinand's successor, Franz Josef. Having outlived his generation of politicians, Metternich died at the age of 86 in 1859. Born into the House of Metternich in 1773, the son of a diplomat, he was named after his godfather, Clement-Wenceslas, Archbishop of Trier. Metternich received a good education at the universities of Strasbourg and Mainz. He was of help during the coronation of Francis II in 1792 and that of his predecessor, Leopold II, in 1790. After a brief trip to England, Metternich was named as the Austrian ambassador to the Netherlands, a short-lived post, since the country was brought under French control the next year. He married his first wife, Eleonore von Kaunitz (a descendant of Karolina of Legnica-Brieg) in 1795, which aided his entry into Viennese society. Despite having numerous affairs, he was devastated by her death in 1825. His second marriage was to Baroness Antoinette Leykam in 1827 and following her death in 1829 he married Countess Melanie Zichy-Ferraris in 1831. She predeceased him by five years. Before taking office as Foreign Minister, Metternich held numerous smaller posts, including ambassadorial roles in the Kingdom of Saxony, the Kingdom of Prussia and Napoleonic France. One of Metternich's sons, Richard von Metternich, was also a successful diplomat; many of Metternich's twelve other acknowledged children predeceased him. A traditional conservative, Metternich was keen to maintain the balance of power, in particular by resisting Russian territorial ambitions in Central Europe and lands belonging to the Ottoman Empire. He disliked liberalism and strove to prevent the breakup of the Austrian empire, for example, by crushing nationalist revolts in Austrian north Italy and the German states. At home, he pursued a similar policy, using censorship and a wide-ranging spy network to suppress unrest. Metternich has been both praised and heavily criticized for the policies he pursued. His supporters point out that he presided over the "Age of Metternich", when international diplomacy helped prevent major wars in Europe. His qualities as a diplomat are commended, some noting that his achievements were considerable in light of the weakness of his negotiating position. His decision to oppose Russian expansionism is seen as a good one. His detractors describe him as a boor who stuck to ill-thought-out, conservative principles out of vanity and a sense of infallibility. They argue he could have done much to secure Austria's future; instead, his 1817 proposals for administrative reform were largely rejected, and his opposition to German nationalism is blamed for Germany's unification under Prussia and not Austria. Other historians have argued that he had far less power than this view suggests and that his policies were only exercised when they were in accord with the views of the Emperor. Klemens Metternich was born into the House of Metternich on 15 May 1773 to Franz George Karl Count Metternich-Winneburg zu Beilstein, a diplomat who had passed from the service of the Archbishopric of Trier to that of the Imperial court, and his wife Countess Maria Beatrice Aloisia von Kageneck. He was named in honour of Prince Clemens Wenceslaus of Saxony, the archbishop-elector of Trier and the past employer of his father. He was the eldest son and had one older sister. At the time of his birth the family possessed a ruined keep at Beilstein, a castle at Winneberg, an estate west of Koblenz, and another in Königswart, Bohemia, won during the 17th century. At this time Metternich's father, described as "a boring babbler and chronic liar" by a contemporary, was the Austrian ambassador to the courts of the three Rhenish electors (Trier, Cologne and Mainz). Metternich's education was handled by his mother, heavily influenced by their proximity to France; for many years Metternich considered himself able to communicate better in French than German. As a child he went on official visits with his father and, under the direction of Protestant tutor John Frederick Simon, was tutored in academic subjects, swimming, and horsemanship. Between the end of 1790 and summer of 1792 Metternich studied law at the University of Mainz, receiving a more conservative education than at Strasbourg, a city the return to which was now unsafe. In the summers he worked with his father, who had been appointed plenipotentiary to the Austrian Netherlands. In March 1792 Francis succeeded his father Leopold as Holy Roman Emperor and was crowned in July, affording Metternich a reprisal of his earlier role of Ceremonial Marshall. To this he added the honour of opening the accompanying ball alongside Louise of Mecklenburg. In the meantime France had declared war on Austria, beginning the War of the First Coalition (1792–7) and making Metternich's further study in Mainz impossible. Now in the employment of his father, he was sent on a special mission to the front. Here he led the interrogation of the French Minister of War the Marquis de Beurnonville and several accompanying National Convention commissioners. Metternich observed the siege and fall of Valenciennes, later looking back on these as substantial lessons about warfare. In early 1794 he was sent to England, ostensibly on official business helping Viscount Desandrouin, by the Treasurer-General of the Austrian Netherlands, to negotiate a loan. In England he met the King on several occasions and dined with a number of influential British politicians, including William Pitt, Charles James Fox and Edmund Burke. Metternich was nominated the new Minister Plenipotentiary to the Austrian Netherlands and left England in September 1794. Unfortunately, he found an exiled and powerless government in headlong retreat from the latest French advance. In October a revitalised French army swept into Germany and annexed all of the Metternich estates except Königswart. Disappointed, and affected by strong criticism of his father's policies, he joined his parents in Vienna in November. On 27 September 1795 he married Countess Eleonore von Kaunitz, a granddaughter of former Austrian chancellor Wenzel Kaunitz. The marriage was arranged by Metternich's mother and introduced him to Viennese society. This was undoubtedly part of the motivation for Metternich, who demonstrated less affection for her than she for him. [nb 2] Two conditions were imposed by the father of the bride, Prince Kaunitz: first, the still youthful Eleonore was to continue to live at home; and second, Metternich was forbidden from serving as a diplomat as long as the Prince was still alive. Their daughter Maria was born in January 1797. After Metternich's studies in Vienna, the Prince's death in September 1797 allowed Metternich to participate in the Congress of Rastatt. 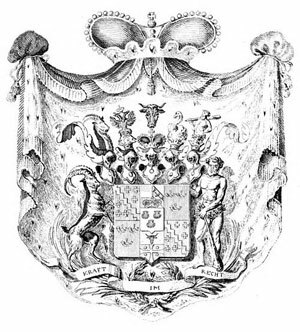 Initially his father took him as a secretary while ensuring that, when proceedings officially started in December 1797, he was named the representative of the Catholic Bench of the College of the Counts of Westphalia. A bored Metternich remained at Rastatt in this role until 1799 when the congress was finally wound down. During this period Eleonore had chosen to live with Metternich at Rastatt and gave birth to sons Francis (February 1798) and, shortly after the end of the Congress, Klemens (June 1799). Much to Metternich's anguish Klemens died after only a few days, and Francis soon contracted a lung infection from which he would never recover. The Holy Roman Empire's defeat in the War of the Second Coalition shook up diplomatic circles, and the promising Metternich was now offered a choice between three ministerial positions: to the Imperial Diet at Regensburg; to the Kingdom of Denmark at Copenhagen; or to the Elector of Saxony at Dresden. He chose Dresden in late January 1801, and his appointment was officially announced in February. Metternich summered in Vienna, where he wrote his "Instructions", a memorandum showing much greater understanding of statesmanship than his earlier writing. He visited the Königswart estate in the autumn before taking up his new position on 4 November. The subtleties of the memorandum were lost on the Saxon court, which was headed by the retiring Frederick Augustus, a man with little political initiative. [nb 3] Despite the boredom of the court, Metternich enjoyed the light-hearted frivolity of the city and took up a mistress, Katharina Bagration, who bore him a daughter, Klementine. 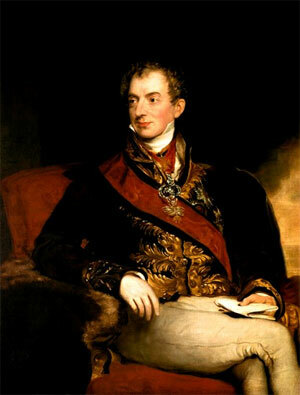 [nb 4] In January 1803 Metternich and his wife had a child whom they named Viktor. In Dresden Metternich also made a number of important contacts including Friedrich Gentz, a publicist who would serve Metternich as both confidant and critic for the next thirty years. He also established links with important Polish and French political figures. — Colloredo to Thugut (Palmer 1972, p. 39). The Imperial Recess of 1803 brought Metternich's family new estates in Ochsenhausen, the title of Prince, and a seat in the Imperial Diet. In the ensuing diplomatic reshuffle Metternich was appointed ambassador to the Kingdom of Prussia, being notified of this in February 1803 and taking his position in November of that year. He arrived at a critical juncture in European diplomacy, soon growing worried about the territorial ambitions of Napoleon Bonaparte, newly the leader of France. This fear was shared by the Russian court under Alexander I, and the Tsar kept Metternich informed of Russian policy. By autumn of 1804 Vienna decided on action entered into in August 1805 when the Austrian Empire (as the Holy Roman Empire was in the process of becoming) began its involvement in the War of the Third Coalition. Metternich's now almost impossible task was to convince Prussia to join the coalition against Bonaparte. 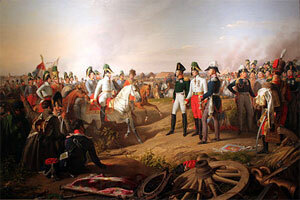 Their eventual agreement was not due to Metternich, however, and after the coalition's defeat at the Battle of Austerlitz, Prussia disregarded the agreement and signed a treaty with the French instead. In the ensuing reshuffle in Vienna Johann Philipp Stadion became the Austrian foreign minister, freeing Metternich to assume the post of Ambassador to the Russian Empire. He never made it to Russia, as need had arisen for a new Austrian at the French court. Metternich was approved for the post in June 1806. [nb 5] He enjoyed being in demand and was happy to be sent to France on a generous salary of 90,000 gulden a year. After an arduous trip he took up residence in August 1806, being briefed by Baron von Vincent and Engelbert von Floret, whom he would retain as a close adviser for two decades. He met French foreign minister Charles Talleyrand on 5 August and Napoleon himself five days later at Saint-Cloud; soon, the War of the Fourth Coalition drew both Talleyrand and Napoleon eastwards. Metternich's wife and children joined him in October, and he went into society, using his charm to win great eminence there. The presence of Eleonore did not prevent him from a series of affairs that certainly included Napoleon's sister Caroline Murat, Laure Junot, and perhaps many besides. In June Metternich left Vienna to personally handle negotiations at Gitschin in Bohemia. When he arrived he benefitted from the hospitality of Princess Wilhelmine, Duchess of Sagan and began an affair with her that lasted several months. No other mistress ever achieved such influence over Metternich as Wilhelmine, and he would continue to write to her after their separation. Meanwhile, French Foreign Minister Hugues-Bernard Maret remained elusive, though Metternich did manage to discuss the state of affairs with the Tsar on 18–19 June at Opotschna. In talks which would later be ratified as the Reichenbach Convention they agreed on general peace demands[nb 6] and set out a process by which Austria could enter the war on the Coalition side. Shortly afterwards Metternich was invited to join Napoleon at Dresden, where he could put the terms directly. Though no reliable record of their meeting on 26 June 1813 exists, it seems it was a stormy but effective meeting. Agreement was finally reached as Metternich was about to leave: peace talks would start in Prague in July and run until 20 August. In agreeing to this Metternich had ignored the Reichenbach Convention, and this angered Austria's Coalition allies. The Conference of Prague would never properly meet, since Napoleon gave his representatives Armand Caulaincourt and the Count of Narbonne insufficient powers to negotiate. At the informal discussions held in lieu of the conference, Caulaincourt implied that Napoleon would not negotiate until an allied army threatened France itself. This convinced Metternich, and, after an ultimatum Metternich issued to France went unheeded, Austria declared war on 12 August. Before talks could begin, Coalition armies crossed the Rhine on 22 December. Metternich retired from Frankfurt to Breisgau to celebrate Christmas with his wife's family before travelling to the new Coalition headquarters at Basel in January 1814. Quarrels with Tsar Alexander, particularly over the fate of France[nb 7] intensified in January, prompting Alexander to storm out. He therefore missed the arrival of Castlereagh in mid-January. Metternich and Castlereagh formed a good working relationship and then met with Alexander at Langres. The Tsar remained unaccommodating however, demanding a push into the centre of France; fortunately, he was too preoccupied to object to Metternich's other ideas, like a final peace conference in Vienna. Metternich did not attend talks with the French at Chatillon, as he wanted to stay with Alexander. The talks stalled, and, after a brief advance, Coalition forces had to retreat after the Montmirail and Montereau. This relieved Metternich's fears that an overconfident Alexander might act unilaterally. Leaving Castlereagh to negotiate on Tsar Alexander's behalf, Metternich briefly turned his attention to quelling anti-Habsburg feeling in Italy. Around the same time, he learnt that the Duchess of Sagan was courting the Tsar. Disappointed, and exhausted by social rounds, Metternich let his guard drop, angering Tsar Alexander during negotiations over Poland (then ruled by Napoleon as the Grand Duchy of Warsaw) by implying Austria could match Russia militarily. The pair would never meet in person again. Despite the blunder, Francis refused to dismiss his foreign minister, and political crisis rocked Vienna throughout November, culminating in a declaration by Tsar Alexander that Russia would not compromise in its claim on Poland as a satellite kingdom. The Coalition rejected this utterly, and agreement seemed further off than ever. During the stand-off, it seems that Alexander even went as far as to challenge Metternich to a duel. Fortunately for Metternich, Tsar Alexander soon did a rapid volte face and agreed to the division of Poland. He also softened in regard to the Germanic Kingdom of Saxony, and for the first time allowed Talleyrand to participate in all Big Four (now Big Five) discussions. At the conference in Vienna later in the year, Metternich found himself constrained by the Kings of Württemberg and Bavaria to abandon his plans to reform the German federation. He now regretted having so quickly forced through its original constitution five years before. Nevertheless, he held ground on other issues and the Conference's Final Act was highly reactionary, much as Metternich had envisaged it. He remained in Vienna until the close in May 1820, finding the whole affair a bore. On 6 May he heard of the death of his daughter Klementine from tuberculosis. Journeying on to Prague, he heard that his eldest daughter Maria had also contracted the disease. He was at her bedside in Baden bei Wien when she died on 20 July. This prompted Eleonore and the remaining children to leave for the cleaner air of France. The rest of 1820 was filled with liberal revolts to which Metternich was expected to respond. Ultimately, the Austrian Foreign Minister was torn between following through on his conservative pledge (a policy favoured by the Russians) and keeping out of a country in which Austria had no interest (favoured by the British). He chose "sympathetic inactivity" on Spain[nb 9] but, much to his dismay and surprise, Guglielmo Pepe led a revolt in Naples in early July and forced King Ferdinand I to accept a new constitution. Metternich reluctantly agreed to attend the Russian-initiated Congress of Troppau in October to discuss these events. He need not have worried: the Tsar gave way and accepted a compromise proposal of moderate interventionism. Still worried by Kapodistrias' influence over the Tsar, he laid down his conservative principles in a long memorandum, including an attack on the free press and the initiative of the middle classes. Fortunately for Metternich the Tsar's dual proposal for the St Petersburg meetings, a settlement of the Eastern Question favourable to Russia and limited autonomy for three Greek principalities, was a pairing unpalatable to the other European powers, and potential attendees like British Foreign Secretary George Canning slowly turned away, much to the annoyance of Alexander. Metternich believed for several months afterward that he had gained a unique level of influence over the Tsar. Meanwhile, he renewed the conservative program he had outlined at Karlsbad five years before and sought to further increase Austrian influence over the German Federal Diet. He also informed the press they could no longer publicise the minutes of Diet meetings, only its rulings. In January 1825 he began to worry about his wife Eleonore's health and he reached her sickbed in Paris shortly before her death on 19 March. Mourning sincerely for her, he also took the opportunity to dine with the Paris elite. Unfortunately, an aside he made about the Tsar there was reported back and did not enhance his reputation. He left Paris for the last time on 21 April and was joined by the Emperor in Milan after arriving on 7 May. He declined the Pope's invitation to become a cardinal of the church. There was also a short trip to Genoa. Early in July the court dispersed and Metternich visited his daughters Leontine (fourteen) and Hermine (nine) in the quiet town of Bad Ischl. Despite the seclusion he received constant reports, including those of ominous developments in the Ottoman Empire, where the Greek revolt was rapidly being crushed by Ibrahim Ali of Egypt. He also had to deal with fallout from St. Petersburg where the Tsar, although unable to convene a full congress, had talked with all the major ambassadors. By mid-May it was clear the allies could not decide on a course of action and, as such, the Holy Alliance was no longer a viable political entity. In the early 1820s, Metternich had advised Francis that convening the Hungarian Diet would help get approval for financial reform. In fact, the Diet of 1825 to 1827 saw 300 sessions filled with criticism of how the Empire had eroded the historic rights of the Kingdom of Hungary's nobility. Metternich complained that it "interfered with [his] time, [his] customs and [his] daily life", as he was forced to travel to Pressburg (modern day Bratislava) to perform ceremonial duties and to observe. He was alarmed by the growth of Hungarian national sentiment and wary of the growing influence of nationalist István Széchenyi, whom he had met twice in 1825. Back in Vienna, in mid-December, he heard of the death of Tsar Alexander with mixed feelings. He had known the Tsar well and was reminded of his own frailty, although the death potentially wiped the soured diplomatic slate clean. Moreover, he could claim credit for foreseeing the Decembrist liberal revolt the new Tsar Nicholas I had to crush. 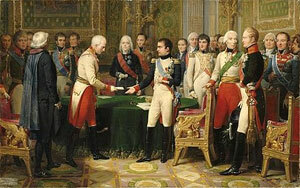 Now 53, Metternich chose to send Archduke Ferdinand to establish first contact with Nicholas. 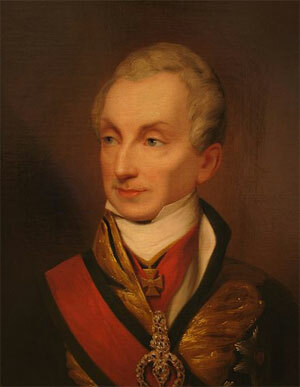 Metternich was also friendly with the British envoy (the Duke of Wellington) and enlisted his help to charm Nicholas. Despite this, the first 18 months of Nicholas' reign did not go well for Metternich: firstly, the British were chosen over the Austrians to oversee Russian-Ottoman talks;[nb 10] and, as a result, Metternich could exercise no influence over the resulting Akkerman Convention. France too began to drift away from Metternich's non-interventionist position. In August 1826 Russian Foreign Minister Nesselrode rejected a proposal by Metternich to convene a congress to discuss the events that eventually led to the outbreak of civil war in Portugal. The Austrian Foreign Minister accepted this with "surprising resilience". On 5 November 1827 Antoinette von Leykam became Metternich's second wife. She was only twenty, and their marriage, a small affair at Hetzendorf (a village just outside Vienna), drew considerable criticism. Antoinette's grace and charm soon won over Viennese society. The same day British, Russian and French forces destroyed the Ottoman fleet at the Battle of Navarino. Metternich worried that further intervention would topple the Ottoman Empire, upsetting the balance so carefully created in 1815. To his relief the new British Prime Minister Wellington and his cabinet were equally fearful of giving Russia the upper hand in the Balkans. After another round of his proposals for congresses was rejected, Metternich stood back from the Eastern Question, watching as the Treaty of Adrianople was signed in September 1829. Though he publicly criticised it for being too harsh on Turkey, privately he was satisfied with its leniency and promise of Greek autonomy, making it a buffer against Russian expansion rather than a Russian satellite state. Metternich's private life was filled with grief. In November 1828 his mother died, and in January 1829 Antoinette died, five days after giving birth to their son, Richard von Metternich. After fighting tuberculosis for many months, Metternich's son Viktor, then a junior diplomat, died on 30 November 1829. Consequently, he spent Christmas alone and depressed, worried by the draconian methods of some of his fellow conservatives and by the renewed march of liberalism. At the Conference of State Metternich lost his principal ally Karel Clam-Martinic in 1840, which furthered the growing paralysis at the heart of Austrian government. Metternich now struggled to enforce even the level of censorship he desired. Fortunately there were no major challenges to the regime from outside. Italy was quiet, and neither Metternich's attempt to lecture the new Prussian king Frederick William IV nor the boredom of the new British Queen Victoria at their first meeting posed immediate problems. Far more worrying was Tsar Nicholas, whose estimation of the Habsburg dynasty and Austria was low. After an impromptu tour of Italy in 1845 the Tsar unexpectedly stopped in Vienna. Already in a bad mood, he was an awkward guest, though in between criticisms of Austria he reassured Metternich that Russia was not about to invade the Ottoman Empire again. Two months later their countries were required to work together over the Galician slaughter and a declaration of independence from Kraków. Metternich authorised the occupation of the city and use of troops to restore order in surrounding areas, intent on undoing the pseudo-independence that had been granted Kraków in 1815. After months of negotiations with Prussia and Russia, Austria annexed the city in November 1846. Metternich regarded it as a personal victory, but it was an action of dubious utility: not only were Polish dissidents now officially part of Austria, the Europe-wide Polish dissident movement was now worked actively against the "Metternich system" that had overridden the rights enshrined in 1815. Britain and France appeared similarly outraged, although calls for Metternich's resignation were ignored. For the next two years Ferdinand could not abdicate in favour of his nephew without a regency; Metternich believed Austria would need him in the interim to hold government together. Though Metternich was tiring, memoranda kept pouring forth from his chancellery. Despite this he did not foresee the building crisis. The new Pope Pius IX was gaining a reputation as a liberal nationalist, counterbalancing Metternich and Austria; at the same time, the Empire experienced unemployment and rising prices as a result of poor harvests. Metternich was bemused at the outcry from Italians, the Pope, and Palmerston when he ordered the occupation of Papal-controlled Ferrara in the summer of 1847. Despite securing French agreement for the first time in years from François Guizot over the Swiss Civil War, France and Austria were forced into backing breakaway cantons. The pair proposed a conference, but the government crushed the revolt. It was a major blow to Metternich's prestige, and his opponents in Vienna called it evidence of his incompetence. In January 1848 Metternich predicted trouble in Italy during the year ahead. [nb 11] He acted on this by dispatching an envoy, Karl Ludwig von Ficquelmont to Italy; by resurrecting his 1817 plans for an Italian chancellery; and by arranging various contingency plans with the French. In late February Austrian Field Marshal Joseph Radetsky placed Austrian Italy (Lombardy-Venetia) under martial law as disturbances spread. Despite this and hearing of renewed revolution in France, Metternich was cautious, still thinking domestic revolution unlikely. He was described by a Saxon diplomat as, in the words of biographer Musulin, "having shrunk to a shadow of his former self". In mid-September the family moved to 42 Brunswick Terrace, Brighton on the south coast of England where tranquillity of life contrasted greatly with the revolutionary Europe left behind. Parliamentary figures, particularly Disraeli, travelled down to visit them, as did Metternich's former friend Dorothea Lieven (Melanie led a reconciliation between the two). Expecting a visit from Metternich's daughter Leontine and her own daughter Pauline, the family moved to a suite of rooms at Richmond Palace on 23 April 1849. Visitors included Wellington, who still watched out for Metternich; Johann Strauss, the composer; and Dorothea de Dino, sister of Metternich's former lover Wilhemine of Sagan;[nb 12] and former lover Katharina Bagration. Metternich was showing his age, and his frequent fainting was cause for worry. The ex-Chancellor was also depressed by the lack of communication from the new Emperor Franz Joseph I and his government. Leontine wrote to Vienna trying to encourage this contact, and in August Metternich received a warm letter from Franz Joseph; sincere or not, it buoyed Metternich considerably. From mid-August Melanie began to push for a move to Brussels, a city cheaper to live in and closer to continental affairs. They arrived in October, staying overnight in the Hotel Bellevue. With revolution subsiding, Metternich was hopeful they would return to Vienna. Their stay in fact lasted over 18 months while Metternich waited for an opportunity to re-enter Austrian politics. It was a pleasant enough (and cheap) stay, first in the Boulevard de l'Observatoire and later in the Sablon area—filled with visits from politicians, writers, musicians and scientists. For Metternich, however, the tedium and homesickness only increased. In March 1851 Melanie induced him to write to the new political force in Vienna, Prince Schwarzenberg, to ask if he might return if he promised not to interfere in public affairs. In April he received an affirmative reply, authorised by Franz Joseph. In May 1851 Metternich left for his Johannisberg estate, which he had last visited in 1845. That summer Metternich enjoyed the company of Prussian representative Otto von Bismarck. He also enjoyed a visit from Frederick William, though the King irritated Metternich by appearing to cultivate him as a tool against Schwarzenberg. 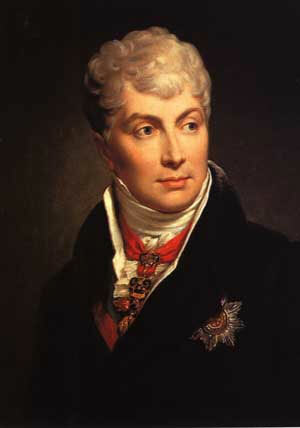 In September Metternich returned to Vienna, entertained along the way by various German princes keen to entertain the focus of Prussian intrigue. Metternich was reinvigorated, dropped his nostalgia, and lived in the present for the first time in a decade. Franz Josef asked for his advice on numerous issues (though he was too headstrong to be much influenced by it), and both of the two emerging factions in Vienna courted Metternich; even Tsar Nicholas called on him during a state visit. Metternich was not keen on the new Foreign Minister, Karl Ferdinand von Buol but thought him sufficiently incompetent that he would be impressionable. Metternich's advice was of varying quality; nonetheless, some of it was usefully insightful, even in modern issues. Now deaf, Metternich wrote endlessly, particularly for an appreciative Franz Josef. He wanted Austrian neutrality in the Crimean War, though Buol did not. [nb 13] In the meantime Metternich's health was slowly failing, and he was a more peripheral figure after the death of his wife Melanie in January 1854. In a brief resurgence of energy in early 1856, he busied himself in arrangements for a marriage between his son Richard and his granddaughter Pauline (Richard's step-sister's daughter) and undertook more travel. The King of the Belgians came to visit, as did Bismarck, and on 16 August 1857 he entertained the future Edward VII of the United Kingdom. Buol, however, was growing more resentful of Metternich's advice, particularly about Italy. In April 1859 Franz Josef came to ask him about what should be done in Italy. According to Pauline, Metternich begged him not to send an ultimatum to Italy, and Franz Josef explained that such an ultimatum had already been sent. Particularly during the remainder of the nineteenth century, Metternich was heavily criticised, decried as the man who prevented Austria and the rest of central Europe from "developing along normal liberal and constitutional lines". Had Metternich not stood in the way of "progress", Austria might have reformed, dealt better with its problems of nationality, and the First World War might never have happened. Instead, Metternich chose to fight an overwhelmingly fruitless war against the forces of liberalism and nationalism. Heavy censorship was just one of a range of repressive instruments of state available to him that also included a large spy network. Metternich opposed electoral reform, criticising Britain’s 1832 Reform Bill. In short, he locked himself into an embittered battle against "the prevailing mood of his age". On the other hand, Metternich’s diplomacy and statesmanship became the focus of praise in the twentieth century from more favourably inclined historians, particularly biographer Heinrich von Srbik. For example, particularly after WWII, historians were more likely to defend Metternich’s policies as reasonable attempts to achieve his goals, chiefly the balance of power in Europe. Sympathetic historians point out that Metternich correctly foresaw and worked to prevent Russian dominance in Europe, succeeding where his successors would fail 130 years later. As argued by Srbik, Metternich himself pursued legality, cooperation, and dialogue, and therefore helped ensure thirty years of peace, the “Age of Metternich”. Authors like Peter Viereck and Ernst B. Haas also give Metternich credit for his more liberal ideals, even if they weighed relatively little in his overall policies. Critical views presuppose Metternich had the ability to shape Europe favorably but chose not to. More modern critiques like that of A. J. P. Taylor have questioned how much influence Metternich actually wielded. Robin Okey, a critic of Metternich, noted that even in the realm of foreign affairs Metternich “had only his own persuasiveness to rely on”, and this degraded over time. By this interpretation, his task was to create a “smokescreen” that hid Austria’s true weakness. When it came to choosing a set of sound principles, wrote Taylor, “most men could do better while shaving.” The result was that Metternich was no captivating diplomat: Taylor described him as “the most boring man in European history.” Not only were his failures limited to foreign affairs, critics argue: at home he was equally powerless, failing to effect even his own proposals for administrative reform. In contrast, those who have attempted to rehabilitate Metternich describe him as “unquestionably [a] master of diplomacy”, someone who perfected and indeed shaped the nature of diplomacy in his era. In a similar vein, Alan Sked argues that Metternich’s “smokescreen” may well have served a purpose in furthering a relatively coherent set of principles. •	Maria Leopoldina (17 January 1797 – 24 July 1820), married on 15 September 1817 to Count Jozsef Esterházy de Galántha. No issue. •	Franz Karl Johann Georg (21 February 1798 – 3 December 1799). •	Klemens Eduard (10 June 1799 – 15 June 1799). •	Roger Armand Viktor Maurice, Baron von Aldenburg (21 October 1827 – 14 October 1906), unmarried. •	Klementine Marie Octavie (30 August 1804 – 6 May 1820). •	Maria Antonia (25 August 1806 – 17 January 1829). •	Pauline Klementine Marie Walburga Sándor de Szlavnicza (25 February 1836 – 28 September 1921), married on 13 June 1856 to her uncle Richard von Metternich. •	Hermine Gabriele (Henrietta) Marie Eleonore Leopoldine (1 September 1815 – December 1890), unmarried. •	Franz Albert Otto Richard Notger (2 September 1879 – 9 May 1895), Hereditary Prince of Oettingen-Oettingen in Oettingen-Spielberg. •	Moritz Joseph Richard Notger (5 May 1885 – 4 October 1911), Hereditary Prince of Oettingen-Oettingen in Oettingen-Spielberg. •	Princess Elisabeth Pauline Georgine Marie Notgera of Oettingen-Oettingen in Oettingen-Spielberg (31 October 1886 – 2 October 1976), married on 19 November 1910 to Prince Viktor III of Hohenlohe-Schillingsfürst-Breunner-Enkevoirth, Duke of Ratibor and Prince of Corvey. •	Antoinette Pascalina (20 April 1862 – 5 August 1890), married on 11 July 1885 to Count Georg Wilhelm von Waldstein. No issue. •	Klementine Marie Melanie Sofie Leontine Crescentia (27 June 1870 – 25 October 1963), unmarried; she adopted Prince Franz Albrecht of Hohenlohe (born 1920; son of her niece Elisabeth), who assumed the title of Prince of Hohenlohe-Schillingsfürst-Metternich-Sándor. •	Melanie Marie Pauline Alexandrine (27 February 1832 – 16 November 1919), married on 20 November 1853 to Count Jozsef Zichy de Zich et Vásonykeö. No issue. •	Klemens (21 April 1833 – 10 June 1833). •	Paul II Alphonse Klemens Lothar Filip Neri Felix Nikomedes, 5th Prince Metternich (26 May 1917 – 21 September 1992), married on 6 September 1941 to Princess Tatiana Hilarionovna Wassiltchikova; he died without issue and the title of Prince Metternich became extinct. •	Emilie Marie Felicitas (24 February 1873 – 20 January 1884). •	Pauline Felix Maria (6 January 1880 – 19 May 1960), married on 5 May 1906 to Prince Maximilian Theodor of Thurn-Taxis. They had one daughter. •	Maria Emilia Stephania (22 March 1836 – 12 June 1836). •	Lothar Stephan August Klemens Maria (13 September 1837 – 2 October 1904), married firstly on 21 April 1868 to Karoline Anna Rosalie Johanna Reittner, and secondly on 5 June 1900 to Countess Františka Mittrowsky von Mittrowitz. No issue in both marriages. •	Countess Marie-Clementine Blome (23 June 1860 – died young). •	Karl Otto Arnold (12 December 1861 – 5 September 1926), Lensgraf Blome; married on 6 July 1907 to Countess Maria Hedwig Ida Leopolda Hermenegilde of Stolberg-Stolberg. No issue. •	Countess Maria Sophie Blome (23 November 1864 – died young). •	Louis Pius Blome (1 December 1865 – 1930), Lensgraf Blome. •	Johannes Hubertus Xaverius (23 February 1867 – 19 July 1945), Lensgraf Blome; married on 19 November 1901 to Princess Martha Elisabeth Maria Stirbey. They had one daughter. •	Countess Maria Adeline Blome (21 August 1868 – died young). •	Countess Anna Maria Blome (11 February 1871 – 9 January 1960), married in 1896 to Franz August Joseph Maria, conde und Edler Herr of Eltz gen. Faust von Stromberg. They had three children. •	Countess Maria Giulia Sidonia Blome (29 December 1873 – 7 January 1939), married in 1906 to Count Joseph of Plaz. They had three children. •	Countess Maria Karola Blome (16 January 1877 – 19 July 1951), a nun. 1. The work was probably revised during a second set of sittings in 1818/9 (Royal Collection 2013). 2. There is no reason to suspect that Eleonore was unhappy with the arrangement (Palmer 1972, pp. 27–31). 3. Frederick Augustus' court was so quiet that Metternich was advised by his British counterpart, Sir Hugh Elliot, to simply invent dispatches; meteorological details dominated the dispatches of the French representative Alexandre de La Rochefoucauld (Palmer 1972, pp. 36–38). 4. 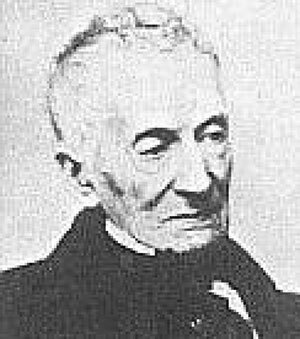 Klementine was acknowledged as Metternich's by both Metternich and a patient Eleonore. She would be Metternich's only known illegitimate child (Palmer 1972, pp. 36–37). 5. There is some confusion over why Metternich was selected. Napoleon said he wanted "a Kaunitz", and whether he literally meant someone from the house of Kaunitz or merely someone in the style of the Prince of Kaunitz, who had been ambassador to France 1750–3, this worked in favour of Metternich, the husband of a Kaunitz (Palmer 1972, pp. 44–47). 6.	, namely that Lübeck and Hamburg would return to being free cities, and more generally the end of direct French control over the Rhenish Confederation; the return of annexed Prussian territory; the return of the Illyrian provinces to Austria; and the dissolution of the French-dominated Grand Duchy of Warsaw (Palmer 1972, p. 97). 7. At this time, the Russians favoured a new monarchy under Jean Bernadotte, while Austria favoured keeping the Bonaparte-Habsburg dynasty, if not under Napoleon himself (Palmer 1972, p. 112). 8. Specifically, four chancellorships became three, one of which was never filled, and Italy did get a chancellery and permission to run its administration, education, and law in Italian; there was to be no new Ministry of Justice, though the Count of Wallis was made head of one new department responsible for legal reform and a new viceroy to Lombardy-Venetia was appointed (one of Francis' earlier concessions) (Palmer 1972, pp. 161–168). 9. Metternich succeeded in preventing proposals for a French-led invasion only by rendering Tsar Alexander fearful of a French conspiracy (Palmer 1972, p. 199). 10. Britain and Austria both wished to avoid war, but the British Foreign Secretary Canning wanted an autonomous Greek state. This would be the topic of mediation with the Ottomans. Metternich, on the other hand, was resolutely opposed to courting instability by redrawing any borders in Eastern Europe(Palmer 1972, pp. 236–237). 11. Sicily erupted in revolution only a fortnight later, but it was Rome he had pinpointed as the epicentre of future trouble(Palmer 1972, pp. 298–311). 12. Several biographers accept the young Pauline's testimony that it was actually Wilhemine who visited. This contradicts, however, the established date of Wilhemine's death—1839 (Palmer 1972, p. 322). 13. When Buol signed an alliance with the Western powers in December 1855—albeit one that did not commit troops—Metternich would have noted with regret how Buol had broken the bonds with Russia he had cultivated for so long(Palmer 1972, pp. 328–340). 5. Nadeau, Ryan (2016). "Creating a Statesman: The Early Life of Prince Clemens von Metternich and its Effect on his Political Philosophy". The Gettysburg Historical Journal. 15(1). ISSN 2327-3917. 28. Cecil 1947, p. 125. 31. J. P. Riley (2013). Napoleon and the World War of 1813: Lessons in Coalition Warfighting. Routledge. p. 206. •	This article incorporates text from a publication now in the public domain: Chisholm, Hugh, ed. (1911). "Metternich-Winneburg, Clemens Wenzel Lothar". Encyclopædia Britannica (11th ed.). Cambridge University Press. •	Bertier de Sauvigny, Guillaume de (1962). Metternich and his times. Ryde, Peter (trans.). London: Darton, Longman and Todd. •	Cecil, Algernon (1947). Metternich (3rd ed.). London: Eyre and Spottiswoode. •	Ford, Franklin L. (1971). Europe, 1780–1830. Hong Kong: Longman. ISBN 978-0-582-48346-0. •	Jarrett, Mark (2013). The Congress of Vienna and its Legacy: War and Great Power Diplomacy after Napoleon. London: I. B. Tauris & Company, Ltd. ISBN 978-1780761169. •	Kissinger, Henry (1954). A World Restored: Metternich, Castlereagh and the Problems of the Peace, 1812–1822 (1999 reprint ed.). London: Weidenfeld & Nicolson. ISBN 978-0-297-64395-1. •	Musulin, Stella (1975). Vienna in the Age of Metternich. London: Faber and Faber. ISBN 0-571-09858-4. •	Nadeau, Ryan (2016). "Creating a Statesman: The Early Life of Prince Clemens von Metternich and its Effect on his Political Philosophy." The Gettysburg Historical Journal 15 (1). ISSN 2327–3917. •	Okey, Robin (2001). The Habsburg monarchy, c. 1765–1918. Macmillan. ISBN 978-0-333-39654-4. •	Palmer, Alan (1972). Metternich: Councillor of Europe (1997 reprint ed.). London: Orion. ISBN 978-1-85799-868-9. •	Sked, Alan (2008). Metternich and Austria: An Evaluation. Basingstoke, England: Palgrave Macmillan. ISBN 978-1-4039-9114-0. •	Sked, Alan (1983). "Metternich". History Today. 33 (6). •	Hamilton-Williams, David (1996). Waterloo New Perspectives: the Great Battle Reappraised. Wiley. ISBN 0-471-05225-6. •	"Clemens Lothar Wenzel, Prince Metternich (1773–1859)". Royal Collection. 2013. Retrieved 22 September 2013. •	Zamoyski, Adam (2007). Rites of Peace: The fall of Napoleon & the Congress of Vienna. ISBN 0-00-712375-2..
•	May, Arthur J. (1933). The Age of Metterchich 1814–1848. Holt, Rinehart and Winston, Inc.;. 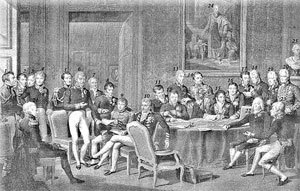 The Congress of Vienna (German: Wiener Kongress), also called Vienna Congress, was a meeting of ambassadors of European states chaired by Austrian statesman Klemens von Metternich, and held in Vienna from November 1814 to June 1815, though the delegates had arrived and were already negotiating by late September 1814. The objective of the Congress was to provide a long-term peace plan for Europe by settling critical issues arising from the French Revolutionary Wars and the Napoleonic Wars. The goal was not simply to restore old boundaries but to resize the main powers so they could balance each other and remain at peace. The leaders were conservatives with little use for republicanism or revolution, both of which threatened to upset the status quo in Europe. France lost all its recent conquests while Prussia, Austria and Russia made major territorial gains. Prussia added smaller German states in the west, Swedish Pomerania and 60% of the Kingdom of Saxony; Austria gained Venice and much of northern Italy. Russia gained parts of Poland. The new Kingdom of the Netherlands had been created just months before, and included formerly Austrian territory that in 1830 became Belgium. The immediate background was Napoleonic France's defeat and surrender in May 1814, which brought an end to 25 years of nearly continuous war. Negotiations continued despite the outbreak of fighting triggered by Napoleon's dramatic return from exile and resumption of power in France during the Hundred Days of March to July 1815. The Congress's "final act" was signed nine days before his final defeat at Waterloo on 18 June 1815. •	Austria was represented by Prince Metternich, the Foreign Minister, and by his deputy, Baron Johann von Wessenberg. As the Congress's sessions were in Vienna, Emperor Francis was kept closely informed. •	Britain was represented first by its Foreign Secretary, Viscount Castlereagh; then by the Duke of Wellington, after Castlereagh's return to England in February 1815. In the last weeks it was headed by the Earl of Clancarty, after Wellington left to face Napoleon during the Hundred Days. •	Tsar Alexander I controlled the Russian delegation which was formally led by the foreign minister, Count Karl Robert Nesselrode. The tsar had two main goals, to gain control of Poland and to promote the peaceful coexistence of European nations. He succeeded in forming the Holy Alliance (1815), based on monarchism and anti-secularism, and formed to combat any threat of revolution or republicanism. •	Prussia was represented by Prince Karl August von Hardenberg, the Chancellor, and the diplomat and scholar Wilhelm von Humboldt. King Frederick William III of Prussia was also in Vienna, playing his role behind the scenes. •	France, the "fifth" power, was represented by its foreign minister, Talleyrand, as well as the Minister Plenipotentiary the Duke of Dalberg. Talleyrand had already negotiated the Treaty of Paris (1814) for Louis XVIII of France; the king, however, distrusted him and was also secretly negotiating with Metternich, by mail. •	Portugal – Plenipotentiaries: Pedro de Sousa Holstein, Count of Palmela; António de Saldanha da Gama, Count of Porto Santo; Joaquim Lobo da Silveira. •	Denmark – Count Niels Rosenkrantz, foreign minister. King Frederick VI was also present in Vienna. •	Switzerland – Every canton had its own delegation. Charles Pictet de Rochemont from Geneva played a prominent role. •	Russia was given most of the Duchy of Warsaw (Poland) and was allowed to keep Finland (which it had annexed from Sweden in 1809 and held until 1917). •	Prussia was given three fifths of Saxony, parts of the Duchy of Warsaw (the Grand Duchy of Posen), Danzig, and the Rhineland/Westphalia. •	A German Confederation of 39 states was created from the previous 300 of the Holy Roman Empire, under the presidency of the Austrian Emperor. Only portions of the territory of Austria and Prussia were included in the Confederation (roughly the same portions that had been within the Holy Roman Empire). •	The Netherlands and the Southern Netherlands (approx. modern-day Belgium) were united in a monarchy, the United Kingdom of the Netherlands, with the House of Orange-Nassau providing the king (the Eight Articles of London). •	To compensate for the Orange-Nassau's loss of the Nassau lands to Prussia, the United Kingdom of the Netherlands and the Grand Duchy of Luxembourg were to form a personal union under the House of Orange-Nassau, with Luxembourg (but not the Netherlands) inside the German Confederation. •	Swedish Pomerania, given to Denmark a year earlier in return for Norway, was ceded by Denmark to Prussia. France received back Guadeloupe from Sweden in return for yearly installments to the Swedish king. •	The neutrality of Switzerland was guaranteed. •	Hanover gave up the Duchy of Lauenburg to Denmark, but was enlarged by the addition of former territories of the Bishop of Münster and by the formerly Prussian East Frisia, and made a kingdom. •	Most of the territorial gains of Bavaria, Württemberg, Baden, Hesse-Darmstadt, and Nassau under the mediatizations of 1801–1806 were recognized. Bavaria also gained control of the Rhenish Palatinate and parts of the Napoleonic Duchy of Würzburg and Grand Duchy of Frankfurt. Hesse-Darmstadt, in exchange for giving up the Duchy of Westphalia to Prussia, received Rhenish Hesse with its capital at Mainz. •	Austria regained control of the Tyrol and Salzburg; of the former Illyrian Provinces; of Tarnopol district (from Russia); received Lombardy-Venetia in Italy and Ragusain Dalmatia. Former Austrian territory in Southwest Germany remained under the control of Württemberg and Baden, and the Austrian Netherlands were also not recovered. •	Habsburg princes were returned to control of the Grand Duchy of Tuscany and the Duchy of Modena. •	The Papal States were under the rule of the pope and restored to their former extent, with the exception of Avignon and the Comtat Venaissin, which remained part of France. •	Britain was confirmed in control of the Cape Colony in Southern Africa; Tobago; Ceylon; and various other colonies in Africa and Asia. Other colonies, most notably the Dutch East Indies and Martinique, were restored to their previous owners. •	The King of Sardinia was restored in Piedmont, Nice, and Savoy, and was given control of Genoa (putting an end to the brief proclamation of a restored Republic). •	The Duchies of Parma, Piacenza and Guastalla were given to Marie Louise, Napoleon's wife. •	The Duchy of Lucca was created for the House of Bourbon-Parma, which would have reversionary rights to Parma after the death of Marie Louise. •	The Bourbon Ferdinand IV, King of Sicily was restored to control of the Kingdom of Naples after Joachim Murat, the king installed by Bonaparte, supported Napoleon in the Hundred Days and started the Neapolitan War by attacking Austria. •	The slave trade was condemned. •	Freedom of navigation was guaranteed for many rivers, notably the Rhine and the Danube. During the wars, Portugal had lost its town of Olivença to Spain and moved to have it restored. Portugal is historically Britain's oldest ally, and with British support succeeded in having the re-incorporation of Olivença decreed in Article 105 of the Final Act, which stated that the Congress "understood the occupation of Olivença to be illegal and recognized Portugal's rights". Portugal ratified the Final Act in 1815 but Spain would not sign, and this became the most important hold-out against the Congress of Vienna. Deciding in the end that it was better to become part of Europe than to stand alone, Spain finally accepted the Treaty on 7 May 1817; however, Olivença and its surroundings were never returned to Portuguese control and this question remains unresolved. Great Britain received parts of the West Indies at the expense of the Netherlands and Spain and kept the former Dutch colonies of Ceylon and the Cape Colony as well as Malta and Heligoland. Under the Treaty of Paris, Britain obtained a protectorate over the United States of the Ionian Islands and the Seychelles. 2. Mark Jarrett, The Congress of Vienna and Its Legacy: War and Great Power Diplomacy after Napoleon (2013) pp. 353, xiv, 187. 5. Article XXXII. See Harold Nicolson, The Congress of Vienna, chap. 9. 6. King, David (2008). Vienna 1814: How the Conquerors of Napoleon Made Love, War, and Peace at the Congress of Vienna. Crown Publishing Group. p. 334. ISBN 978-0-307-33716-0. 7. Nicolson, Harold (1946). The Congress of Vienna; a Study in Allied Unity, 1812–1822. Constable & co. ltd. p. 158. 8. Malettke, Klaus (2009). Die Bourbonen 3. Von Ludwig XVIII. bis zu den Grafen von Paris (1814–1848) (in German). 3. Kohlhammer. p. 66. ISBN 3-17-020584-6. 9. Treaty between Great Britain and Portugal, January 22, 1815. 5 George IV. London: His Majesty's Statute and Law Printers. 1824. p. 650. 10. Freksa, Frederick (1919). A peace congress of intrigue. trans. Harry Hansen (1919). New York: The Century Co. p. 116. 11. Zamoyski, Adam (2007). Rites of Peace; the Fall of Napoleon and the Congress of Vienna. HarperCollins Publishers. p. 297. ISBN 978-0-06-077518-6.: "[...] the Danish plenipotentiary Count Rosenkrantz." 12. Couvée, D.H.; G. Pikkemaat (1963). 1813–15, ons koninkrijk geboren. Alphen aan den Rijn: N. Samsom nv. pp. 123–124. 13. "[Castlereagh, during his stay in The Hague, in January 1813] induced the Dutch to leave their interests entirely in British hands." On page 65 of Nicolson (1946). 14. Nicolson, Harold (1946). The Congress of Vienna; a Study in Allied Unity, 1812–1822. Constable & co. ltd. p. 197.: "Baron von Gagern – one of the two plenipotentiaries for the Netherlands." 15. Page 195 of Nicolson (1946). 16. Zamoyski, Adam (2007). Rites of Peace; the Fall of Napoleon and the Congress of Vienna. HarperCollins Publishers. p. 257. ISBN 978-0-06-077518-6.: "The Pope's envoy to Vienna, Cardinal Consalvi [...]"
19. Zamoyski, Adam (2007). Rites of Peace; the Fall of Napoleon and the Congress of Vienna. HarperCollins Publishers. pp. 258, 295. ISBN 978-0-06-077518-6. 23. Susan Mary Alsop (1984). The Congress Dances. New York: Harper & Row, Publishers. p. 120. 24. Wenceslao Ramírez de Villa-Urrutia, Marqués de Villa-Urrutia, España en el Congreso de Viena según la correspondencia de D. Pedro Gómez Labrador, Marqués de Labrador. Segunda Edición Corregida y Aumentada (Madrid: Francisco Beltrán, 1928), 13. 25. Antonio Rodríguez-Moñino (ed. ), Cartas Políticas (Badajoz: Imprenta Provincial, 1959), 14 (Letter IV, 10 July 1814). Labrador's letters are full of such pungent remarks, and include his opinions on bad diplomats, the state of the postal system, the weather, and his non-existent salary and coach and accompanying livery for the Congress. 26. Villa-Urrutia, España en el Congreso de Viena, 61–2. Joseph had left Madrid with a huge baggage train containing pieces of art, tapestries, and mirrors. The most rapacious of the French was Marshal Nicolas Soult, who left Spain with entire collections, which disappeared to unknown, separate locations around the world. According to Juan Antonio Gaya Nuño, at least "[the paintings] have come to spread the prestige of Spanish art around the whole word." 27. W.H. Zawadzki, "Russia and the Re-Opening of the Polish Question, 1801-1814," International History Review (1985) 7#1 pp 19-44. 28. Couvée, D.H.; G. Pikkemaat (1963). 1813–15, ons koninkrijk geboren. Alphen aan den Rijn: N. Samsom nv. pp. 127–130. •	Dakin, Douglas. "The Congress of Vienna, 1814–1815 and its Antecedents" in Alan Sked, ed., Europe's Balance of Power 1815–1848 (London: Macmillan, 1979), pp. 14–33. •	Gulick, E. V. "The final coalition and the Congress of Vienna, 1813-15" in C. W. Crawley, ed., The New Cambridge Modern History, vol 9, 1793-1830 (1965) pp 639–67. •	King, David (2008). Vienna 1814; How the Conquerors of Napoleon Made Love, War, and Peace at the Congress of Vienna. Random House Inc. ISBN 978-0-307-33716-0. •	Kissinger, Henry (1957). A World Restored; Metternich, Castlereagh and the Problems of Peace, 1812–22. Boston: Houghton Mifflin. •	Spiel, Hilde (1968). The Congress of Vienna; an Eyewitness Account. Philadelphia: Chilton Book Co.
•	Rowell, Christopher and Wolf Burchard, 'The British Embassy at Palais Stahremberg: Furniture from the Congress of Vienna at Mount Stewart’, Furniture History LIII (2017): 191-224. •	Vick, Brian. The Congress of Vienna. Power and Politics after Napoleon. Harvard University Press, 2014. ISBN 978-0-674-72971-1. •	Zamoyski, Adam (2007). Rites of Peace; the Fall of Napoleon and the Congress of Vienna. HarperCollins Publishers. ISBN 978-0-06-077518-6. •	Ghervas, Stella (2008). Réinventer la tradition. Alexandre Stourdza et l'Europe de la Sainte-Alliance. Paris: Honoré Champion. ISBN 978-2-7453-1669-1.